Team Victory — 2014 Desert Classic 50+ Champions. Greg Bertrand (top row, third from right) threw all 18 innings in the title game. Rafael Fuentes, (front, third from left) knocked in game winning run with a sacrifice fly. 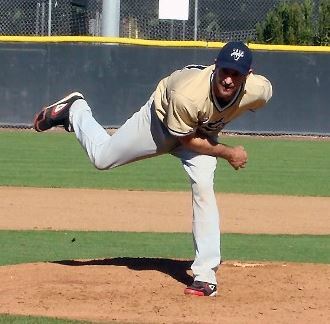 PALM DESERT, CA – Greg Bertrand delivered one of the most remarkable accomplishments in Men’s Senior Baseball League history, throwing an astonishing 18 innings to help lead Team Victory to a Desert Classic championship in the 50+ Wood Bat Division at College of the Desert. Bertrand allowed just one run as Team Victorydefeated the Agua Dulce Reds 2-1 after manager Rafael Fuentes drove in Frank Bons in the 18th inning on a walk-off sacrifice fly in an instant classic that lasted five hours. “It was barely believable,” said Reds’ skipper Gary Firestone. Bertrand relied primarily on his slider, allowing just eight hits while striking out five in a marathon record-breaking day on the mound. And it wasn’t like he was facing a weak lineup. The Reds averaged nearly nine runs per game in round robin play, and had just come off a semifinal in which they buried the number two seeded San Diego Mariners 17-2. Bertrand’s catcher, Pokey Sanchez, said Bertrand was right on target in the championship. After squandering a bases-loaded opportunity with no outs in the 14th inning, Team Victory received a spark in the 18thwhen Bons led off with a single. Doug Thigpen followed with an infield single that allowed Bons to advance to second base. The ensuing batter, Bob Pone, hit a soft grounder on the infield. The Reds tried to throw Bons out at third but the umpire ruled that Bons just beat the throw to the bag. Fuentes then took advantage, hitting the sacrifice fly to right field that sealed the championship for Team Victory. Fuentes stressed the importance of team play as a manager, but couldn’t resist acknowledging the MVP-like performance from Bertrand. Bertrand credits his training for his success as a pitcher. The Reds took an early 1-0 lead in the third inning when Jorge Flores drove in Javier Periera. However Aqua Dulce was only able to put up one run on the board despite four hits and a walk in the inning. Team Victory responded by tying the game at 1-1 in the sixth inning when Thigpen scored on an RBI-bunt by Pone. Both teams struggled to get anything going offensively despite the fact Team Victory recorded a hit in every inning with the exception of the 15th. Reds pitchers Tracy Wheelen, Gregerio Alatome and Tony Couarrubias combined to allow just two runs despite giving up 20 hits. Pitching aside, Firestone said defense was off the charts. “Nothing got through the infield,” he said. Donald Bell, Manny Salinas, Sanchez, Rosario Carrion, Buzzy Sailer and Bons recorded multiple hits for Team Victory, who defeated theCentral Cost Hogs 6-2 in the semifinals earlier in the day. The 2014 Desert Classic was Team Victory’s first 50+ tournament, but a majority of the team has been together for eight years, winning six tournaments. Fuentes acknowledged their chemistry is a key factor to their success.